Since a child, the Italian singer-songwriter Angelica Lubian shows a marked inclination towards the arts’ world in its various forms and soon begins to play “with” the piano keys. She undertakes the singing experience participating to the main national competitions and taking part to different musical bands. At the dawn of the new millennium, the turning-point: the necessity to write words and music grows stronger. Angelica grasps the acoustic guitar and gives life to her first sounding little creatures. In 2006 Angelica Lubian graduates with a dissertation thesis, whose title is Il Rock come Appartenenza Sociale (Rock as Social Belonging), gaining full marks and honours. During the last years the young songwriter plays her own music throughout Italy, both with her bandmates (Louis Armato, Alessandro Scolz and Alessio Benedetti) and as acoustic soloist in prestigious clubs of the national artistic scene. 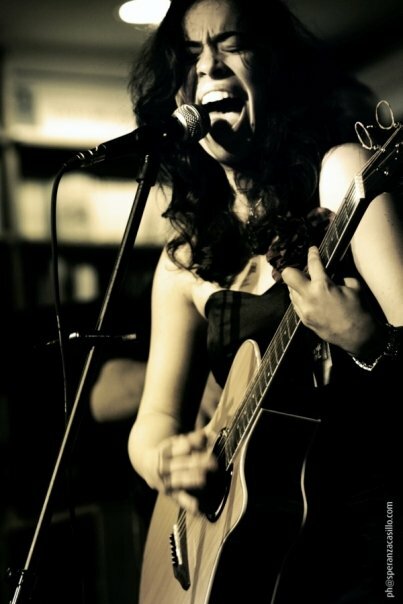 In October 2008 the publishing of Angelica Lubian’s debut album, entitled Conservare in luogo fresco e asciutto (Store in a cool and dry place), warmly welcomed by public and press, gaining enthusiastic articles and reviews on authoritative national newspapers. In April 2010 she presents her new single Nosferatu on national television Raiuno with a preview of its video. In December 2010 Angelica presents the video of the new single Pur che se ne parli, out on January 1st, 2011. In September 2011 the singer-songwriter presents Morso dopo morso – Canzoni a svelare un amore, an innovative multisensorial show-concert conceived by Angelica herself. Successfully welcomed by public and press, the original concept-concert places the music at the very center of the show and enriches it with particular scenic elements, such as an extravagant scenography and evocative light effects, apt to guide the spectator through the recounted love story. For the occasion Angelica publishes the album Morso dopo morso, which retraces the evolution of the homonymous show. In December 2011 her new single L’oroscopo del giorno is out, accompanied by an original video, which is presented on national television Raiuno. On April 13th the singer-songwriter publishes Counting Sheep, the very first anglophone release for Angelica, accompanied by a funny music video signed by the young director Apollo (Andrea Pollano), which is in rotation on national tv Mediaset. On May 27th she wins the national award Premio Pigro Ivan Graziani with the new song Che ci faccio?. In November 2013 she publishes the new video Per la cronaca, finalist song at the Premio Fabrizio De André. At the end of 2014, together with the double-bassist Simone Masina, she publishes on YouTube just for fun a live-cover of the hit Always on the Run by Lenny Kravitz. The video immediately gains curious attention and enthusiastic approval on the Web, reaching tens of thousands of views and sharings worldwide in the first few weeks. And so the journey of Peekaboom (Angelica’s new side project) begins; a game poised between tradition and innovation, an explosive combo of voice, double-bass and electronics, strengthened by their live impact and the affinity of their performance, the hallmarks of this unique duo. Great news coming soon. Stay tuned!